Chances are that if you have moved out-of-town you will suddenly acquire a garden a little larger than you are used to. It could be a few feet bigger or it could be an impressive acreage. When I moved from a roof garden to a garden with a lawn, beds, a very small wood, lots of old trees and past planting schemes my Mother in Law (who can transform any plot into a garden haven) sent me Helen Dillon’s book ‘On gardening’. It takes you through the seasons with witty, informed insights into what you should be looking out for and how to tackle your patch. (Keep in mind that it is written in the mid 90’s so it’s easy to forget that we hadn’t experienced a really cold winter for years). That said, I’m the laziest of gardeners. My defence is that if I applied myself I’d become addicted. Once I’m out there I completely overdo it until it’s either dark or someone demands that the cafe that is our kitchen opens again. It’s incredibly absorbing, you can sort the world out whilst weeding or clearing leaves. It’s ‘me’ time with a purpose. Last week I was reminded once again as to why I will never be a good gardener. Our neighbour’s snowdrops, shielded from the worst of the rain and wind behind a stone urn had peeked through and January suddenly felt more manageable. It’s amazing how such a small flower can signal lighter days. About ten years ago I promised myself that I would plant a carpet of snowdrops. That plan still seems to be on the ‘to do’ list. And by carpet I probably mean rug, but the idea was to plant a signal that winter would be on the wane. But this year is going to be different. Spurred on by a fallen tree I’ve decided that my small woodland could do with some help. 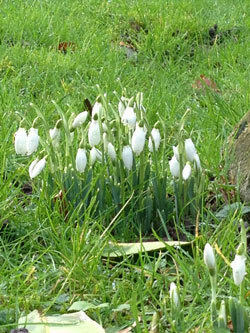 Snowdrops need to be planted ‘in the green’ i.e.in late February with leaves still green. I’ll order them online (e.g. www.cambosnowdrops.com). Sent wrapped in newspaper with moist moss protecting them, they will need planting straight away in a shady spot ideally with some leaf mould and plant food. 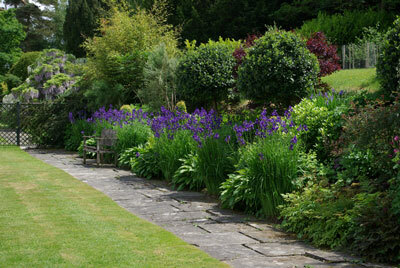 And maybe I’ll add some aconites, more hellebores …Beth Chatto, here we come.